A unique and rare find, nestled in the heart of the vibrant, popular beachside suburb of Glenelg, opposite picturesque Colley Reserve and Glenelg Beach. The heritage-style, self-contained apartment, combines the latest luxurious modern conveniences with old world charm to provide exceptional comfort and enable guests to have a relaxed and enjoyable stay. This first floor, character apartment boasts an elegantly draped, magnificent ornate, King-size, 4-Poster bed in a spacious, open planned bedroom, lounge and dining room. 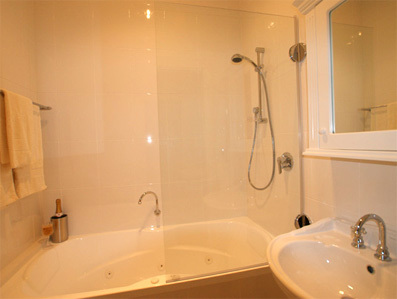 Its separate bathroom offers you the pleasure of ‘relaxing in the warmth’ of a deluxe 2-person spa bath together with an adjustable shower rail. And has a vintage pedestal vanity basin and toilet. Finally, it offers a well-equipped private kitchen with hidden laundry facilities, high ceilings, polished Baltic pine floor boards, and flat screen LCD TV viewing from either the warmth of your bed, whilst sitting in your comfortable lounge chair or at the antique dining table. Enjoy the convenience of having everything you need within walking distance. Take a stroll along Glenelg’s favourite white sandy beach, or watch the stunning sunset, head along the foreshore to Holdfast Shores Marina Pier or towards the famous cosmopolitan Jetty Road for shopping, food and fun. Board the tram at Moseley Square and head to the City to visit the Festival Theatre, Adelaide Casino, Art Gallery, Museum or Rundle Mall for more shopping. Just 10 minutes drive from the Adelaide International and Domestic Airport and 20 minutes from the City of Adelaide. Close to Golf Courses, Morphetville Race course, Harbour Town Outlet Shopping Precinct, and a short drive to the famous wine regions of the Barossa, Adelaide Hills and McLaren Vale and other major Adelaide attractions. Perfect for couples of all ages! 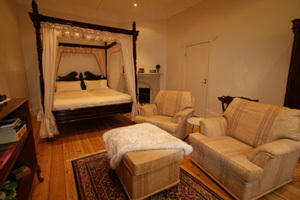 Ideal for anniversaries, special occasions, quiet time away with that special someone. For those who want to feel like a prince or princess in their very own grand, King-size, 4-Poster bed. Please contact the manager, Anita McDonald with your specific dates and accommodation needs to obtain the tariff. or by using our Booking Enquiry Form to assist us with your enquiry. Regarding check in, could you please phone Anita's mobile: 0411 102 773 approximately 30 minutes prior to check in. Please remember to leave keys and the car park permit inside the apartment. Cancellations notified 30 days or less to arrival day, will forfeit all monies paid unless we are able to rebook your entire stay to another group at full tariff. Cancellations made due to unforseen reasons, may have the option for us to hold all monies in credit against a future booking to be taken within a time frame that is mutually agreed upon by both parties.If the future booking is not taken within the agreed time then all monies paid will be forfeited.We recommend you take out travel insurance to provide protection against loss due to illness, injury, death, loss of luggage and cancellation of travel.